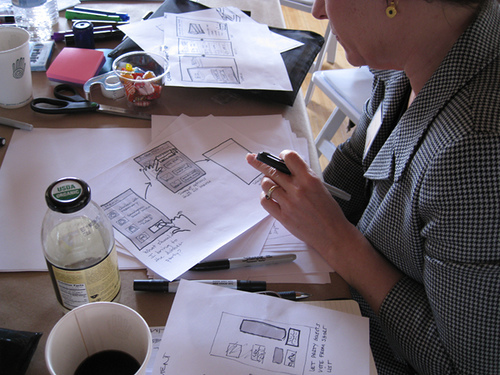 Day 1: Stephanie Vargo sketching out her concepts. It’s no surprise that Adaptive Path’s 2 day workshop on sketching and prototyping was such a great experience. I attended UX Intensive in Austin in December of 2008, and was taken by the passion and depth of the discussion and team based activities. Leah Buley and Rachel Glaves lead most of the presentation and hit a homerun with well crafted content. The first day we dove into sketching as Rachel walked us through methods of how to get ideas across in the simplest way, with the most impact. We quickly learned how to visually express challenging design ideas, like gestures and human emotions. Leah and Rachel got us sketching right away, so by the end of our first day, we where no longer worried about being ‘terrible at drawing’. In fact, most of us were pleasantly surprised at how we had improved in a few hours time. Day 2: Isadora updates our sketchboard. The second and final day was focused around prototyping our ideas and making them come to life. David Verba presented his ‘Why Prototype?’ material with great proofs for ways to have prototyping really count and garnish the best results. 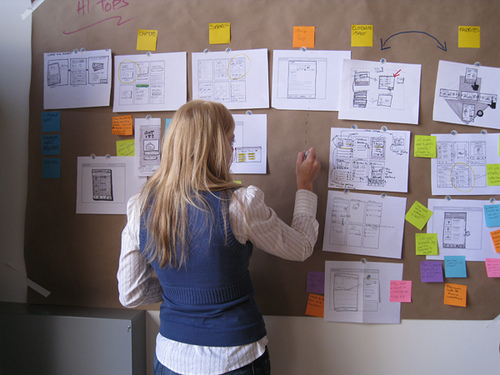 As with every workshop Adaptive Path creates a client/project scenario for the teams to work on. Our team; Josh Gould of Flixster, Justin Singer of Walmart.com, Isadora Marlow-Morgan of iMedia Connection , Susan Michael of Aplia, Stephanie Vargo of Market Surf, Gilberto Medrano of ThoughtWorks and I narrowed down the most important interactions of our product to show and develop. The idea, a food identifier iPhone app for collecting and discovering recipes, would ‘recognize’ (we employed a bit of magic to make that possible) the food or dish in a photo and then help you discover recipes and ingredients. By the end of the day we were showing off our product with the other teams and generally having a blast in the process. Many thanks go out to Leah Buley, Rachel Graves and David Verba for their guidance and thought leadership. I think everyone in the workshop walked away empowered and energized. Also thanks to everyone on the team I worked with, I had so much fun and learned bunches from all of you!